The Kharijites were a portion of Ali's supporters that defected and later opposed both parties. The First Fitna (Arabic: فتنة مقتل عثمان‎, translit. Fitnat Maqtal ʿUthmān, lit. 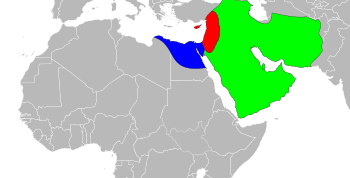 'Fitna of the Killing of Uthman'‎) was a civil war within the Rashidun Caliphate which resulted in the overthrowing of the Rashidun caliphs and the establishment of the Umayyad dynasty. It began when the caliph Uthman ibn Affan was assassinated by Egyptian rebels in 656 and continued through the four-year reign of Uthman's successor Ali ibn Abi Talib. It ended in 661 when Ali's heir Hasan ibn Ali concluded a treaty acknowledging the rule of Muawiyah, the first Umayyad caliph. The Islamic state expanded very quickly under Muhammad and the first three caliphs. In 639 Muawiyah I was appointed the Governor of Syria by Umar after his elder brother Yazid ibn Abi Sufyan (Governor of Syria) died in a plague, along with Abu Ubaidah ibn al-Jarrah (the Governor before him) and 25,000 other people. The rapid Muslim conquest of Syria and Egypt and the consequent Byzantine losses in manpower and territory meant that the Eastern Roman Empire found itself struggling for survival. The Sassanid Dynasty in Persia had already collapsed. The Islamic empire expanded at an unprecedented rate, but there was a cost associated with it. Many desert nomads and some bandits living between current-day Iraq and Saudi Arabia also joined in, not out of commitment to Islam but to share the spoils and benefit from the change in the social order, after the defeat of the Persian Empire. Before Islam, the Roman-Persian Wars and the Byzantine–Sasanian wars had occurred every few years for hundreds of years between 69 BC and 629 AD. High taxes were imposed on the populations in both the Byzantine Roman and Sassanid Persian empires to finance these wars. There was also continuous bloodshed of the people during these wars. The Arab tribes in Iraq were paid by the Persian Sassanids to act as mercenaries, while the Arab tribes in Syria were paid by the Byzantines to act as their mercenaries. The Persians maintained an Arab satellite state of Lakhm and the Byzantine Empire maintained the Arab satellite state of Ghassan, which they used to fight each other. The Syrians and the Iraqis had been fighting each other for centuries. Therefore, each wanted the capital of the newly established Islamic state to be in their area. As Uthman ibn Affan became very old, Marwan I, a relative of Muawiyah I, slipped into the vacuum and became his secretary, slowly assuming more control and relaxing some of these restrictions. Marwan I had previously been excluded from positions of responsibility. Muhammad ibn Abi Bakr, the son of Abu Bakr and the adopted son of Ali ibn Abi Talib and Muhammad bin Abi Hudhaifa, the adopted son of Uthman, had no senior positions. Sects started to form, among them the Sabaites named after Abdullah Ibn Saba There is also Jewish literature from that time, regarding Abdullah Ibn Saba. Much of the Jewish literature on him from that time regards him as an apostate from Judaism and asks Jews to keep away from him. There was also the movement towards more autonomous tribal groupings, which was particularly strong in Kufa, in Iraq; they wanted to rule their own states. Among them developed a group called the Qurra, which later became known as the Kharijites. The earliest reference to these people are as Ahl al-Qura, the people of the village, those who fought with Abu Bakr against the desert tribes of Yamama during the Ridda wars when some of the tribes refused to pay taxes. Afterwards they were granted trusteeship over some of the lands in Sawad in Iraq and were now called Ahl al Ayyam, those who had taken part in the eastern conquests. Some modern scholars like R. E. Brunnow trace the origins of the Qurra and the Kharitites back to Bedouin stock and desert tribesmen, who had become soldiers not out of commitment to Islam but to share the spoils. Brunnow held that the Kharijites were Bedouin Arabs or full blooded Arabs. The Qurra received the highest stipend of the Muslim army, the sharaf al ata, and they had the use of the best lands which they came to regard as their private domain. The Qurra received stipends varying between 2,000 and 3,000 dirhams, while the majority of the rest of the troops received only 250 to 300 dirhams. The other Ridda tribesmen in Kufa, in Iraq, resented the special position given to the Qurra. The tension between the Ridda tribesmen and the Qurra threatened the Qurra's newly acquired prestige. The Qurra therefore felt obliged to defend their position in the new but rapidly changing society. The Qurra were mainly based in Kufa, in Iraq. They had not been involved in Syria. But later when Uthman declined to give them more lands in Persia they felt that their status was being reduced and therefore started to cause trouble. He also removed the distinction between the Ridda and pre-Ridda tribesmen which was not to their liking and lessened their prestige. As a result, they rebelled. Some of the people with their tribal names as Qurra had been expelled from Kufa, in Iraq, for fomenting trouble and were sent to Muawiyah in Syria. Then they were sent to Abdur Rahman ibn Khalid ibn Walid who sent them to Uthman in Madina. In Madina they took an oath that they would not cause trouble and following the example of Muhammad, Uthman accepted their word and let them go. They then split up and went to various different Muslim centers and started fomenting rebellion, particularly in Egypt. The Qurra then felt that Abu Musa al-Ashari could look after their interests better. In 655 the Qurra stopped Uthman's governor Sa'id ibn al-As at Jara'a, preventing him from entering Kufa and declared Abu Musa al-Ashari to be their governor. In 656, The Qurra approached Muhammad ibn Abi Bakr the son of Abu Bakr and the adopted son of Ali ibn Abi Talib and asked him why he was not a governor. They had fought under the service of his father in the Ridda wars. They also asked Uthman's adopted son, Muhammad bin Abi Hudhaifa, who Uthman had refused to appoint as a governor of any province, why he was not a governor. As Muawiyah and Caliph Uthman were preparing to besiege Constantinople, in 656, Muhammad ibn Abi Bakr, the son of Abu Bakr who was also the adopted son of Ali ibn Abi Talib, showed some Egyptians the house of Uthman ibn al-Affan. Finding the gate of Uthman's house strongly guarded by his supporters, the Qurra climbed the back wall and sneaked inside, leaving the guards on the gate unaware of what was going on inside. Hassan and Hussein were also guarding Uthman at the time. The rebels entered his room and struck blows at his head. Muawiyah sent a relief force led by Habib ibn Maslama al-Fihri to protect Uthman, but events moved so fast that Uthman got killed before they arrived, so they turned back from the wadi I kura According to al-Baladhuri one of the earliest books of these events, Ali was furious and slapped Hassan and Hussein saying "How did he get killed when you were at the door?" Uthman's death had a polarizing effect in the Muslim world at the time. Questions were raised not only regarding his character and policies but also the relationship between Muslims and the state, religious beliefs regarding rebellion and governance, and the qualifications of rulership in Islam. Ali was then asked by the people in Madina to become the Caliph. Ali then assumed the position of caliph. Ali had also been the chief judge in Madina. But unlike many of the other companions of Muhammad, Ali had not been involved in the camel caravan trade and had less business and administrative experience. Ali was convinced to make Kufa the capital. Muawiyah I the governor of Syria, a relative of Uthman ibn al-Affan and Marwan I wanted the murderers of Uthman arrested. In Iraq many people hated the Syrians. Some of Ali's supporters were also very extreme in their views and considered everyone to be their enemy. They also felt that if there was peace, they would be arrested for the killing of Uthman. Many of them later became the Kharijites and eventually killed Ali. Aisha (Aisha bint Abu Bakr) (Muhammad's widow), Talhah (Talha ibn Ubayd-Allah) and Zubayr ibn al-Awam (Abu ‘Abd Allah Zubayr ibn al-Awwam) then went to Iraq to ask Ali to arrest Uthman ibn Affan's killers, not to fight Muawiyah. Talhah, Al-Zubayr, and Muhammad's wife Aisha bint Abu Bakr gathered in Mecca and then went to Basra. Some chieftains of the Kufa tribes contacted their tribes living in Basra. A Chieftain contacted Ali to settle the matter. Ali did not want to fight and he agreed. He then contacted Aisha and spoke to her, "Is it wise to shed the blood of five thousand for the punishment of five hundred?" She agreed to settle the matter. Ali then met Talha and Zubair and told them about the prophecy of Muhammad. Ali's cousin Zubair said to Ali "What a tragedy that the Muslims who had acquired the strength of a rock are going to be smashed by colliding with one another". Both Talha and Zubair did not want to fight and left the field. Everyone was happy, except for the people who had killed Uthman and the supporters of Ibn Saba and the Qurra, who thought that if a settlement was reached, they would not be safe. The Qurra and the Sabaites launches a night attack and started burning the tents. Ali attempted to restrain his men but nobody paid attention, as every one thought that the other party had committed break of trust. Confusion prevailed throughout the night. The Qurra and the Sabaites attacked the Umayyads and the fighting started. Qazi K'ab of Basra advised Aysha to mount her camel tell people to stop fighting. Ali's cousin Zubair was by then making his way to Medina and he was killed in an adjoining valley by a Sabait called Amr ibn Jarmouz, who had followed Zubair and murdered him while he was praying. Talhah also left. On seeing this, Marwan shot Talhah with a poisoned arrow saying that he had disgraced his tribe by leaving the field. With the two generals Zubair and Talhah gone confusion prevailed and the Qurra, the Sabaites and the Umayyads fought. Aisha's brother Muhammad ibn Abi Bakr, who was Ali's commander and adopted son, then approached Aisha. Ali pardoned Aisha and her brother escorted her back to Medina. Hassan also accompanied her part of the way back to Madina. Marwan and some of Ali's supporters who later became the Kawarij caused a lot of trouble. Marwan was arrested but he later asked Hassan and Hussein for assistance and was released. Marwan later became an Umayyad ruler, as did his son. After this battle Marwan and Aisha did not get along. Combat between the forces of Ali and Muawiyah I during the Battle of Siffin, from the Tarikhnama. Ali's inability to punish the murderers of Uthman and Muawiyah's refusal to pledge allegiance eventually led Ali to move his army north to confront Muawiyah. The two armies encamped themselves at Siffin for more than one hundred days, most of the time being spent in negotiations. Neither side wanted to fight. Then on 29 July 657 (11th Safar), the Iraqis under Ashtar's command, the Qurra in Ali's army, who had their own camp, started the fighting in earnest. The batte lasted three days. The loss of life was terrible. Suddenly one of the Syrians, Ibn Lahiya, out of fear of further civil war and unable to bear the spectacle rode forward with a copy of the Quran on the ears of his horse to call for judgement by the book of Allah, and the other Syrians followed suit. Everyone on both sides took up the cry, eager to avoid killing their follow Muslims - except for the conspirators. The majority of Ali's followers supported arbitration. Nasr b Muzahim, in one of the earliest sources states that al-Ashath ibn Qays, one of Ali's key supporters and a Kufan, then stood up and said:"O company of Muslims! You have seen what happened in the day which has passed. In it some of the Arabs have been annihilated. By Allah, I have reached the age which Allah willed that I reach. but I have never ever seen a day like this. Let the present convey to the absent! If we fight tomorrow, it will be the annihilation of the Arabs and the loss of what is sacred. I do not make this statement out of fear of death, but I am an aged man who fears for the women and children tomorrow if we are annihilated. O Allah, I have looked to my people and the people of my deen and not empowered anyone. There is no success except by Allah. On Him I rely and to Him I return. Opinion can be both right and wrong. When Allah decides a matter, He carries it out whether His servants like it or not. I say this and I ask Allah's forgiveness for me and you." Then, Nasr b Muzahim says people looked at Muawiya who said "He is right, by the Lord. If we meet tomorrow the Byzantines will attack our women and children and the people of Persia will attack the women and children of Iraq. Those with forebearance and intelligence see this. Tie the copies of the Quran to the ends of the spears". So the fighting stopped. Every time Ali tried to negotiate the Qurra and the Sabait started wars and launched night attacks, fearing that if there was peace, then they will be arrested. It was decided that the Syrians and the residents of Kufa, in Iraq, should nominate an arbitrator, each to decide between Ali and Muawiya. The Syrians choice fell on Amr bin al-A'as who was the rational soul and spokesman of Muawiya. 'Amr ibn al-'As was one of the generals involved in expelling the Romans from Syria and also expelled the Romans from Egypt. A few years earlier 'Amr ibn al-'As with 9,000 men in Palestine had found himself confronting Heraclius' 100,000 army until Khalid crossed the Syrian desert from Iraq to assist him. He was a highly skilled negotiator and had previously been used in negotiations with the Heraclius the Roman Emperor. Ali wanted Malik Ashtar or Abdullah bin Abbas to be appointed as an arbitrator for the people of Kufa, Iraq, but the Qurra strongly demurred, alleging that men like these two were, indeed, responsible for the war and, therefore, ineligible for that office of trust. They nominated Abu Musa al-Ashari as their arbitrator. (During the time of Uthman, they had appointed Abu Musa al-Ashari as the Governor of Kufa and removed Uthams governor before they started fighting Uthman) Ali found it expedient to agree to this choice in order to ward off bloody dissensions in his army. According to "Asadul Ghaba", Ali had, therefore, taken care to personally explain to the arbitrators, "You are arbiters on condition that you decide according to the Book of God, and if you are not so inclined you should not deem yourselves to be arbiters." When the arbitrators assembled at Daumet-ul-Jandal, which lay midway between Kufa and Syria and had for that reason been selected as the place for the announcement of the decision, a series of daily meetings were arranged for them to discuss the matters in hand. When the time arrived for taking a decision about the caliphate, Amr bin al-A'as convinced Abu Musa al-Ashari that they should deprive both Ali and Muawiya of the caliphate, and give to the Muslims the right to elect the caliph. Abu Musa al-Ashari decided to act accordingly. As the time for announcing the verdict approached, the people belonging to both parties assembled. Amr bin al-A'as requested Abu Musa to take the lead in announcing the decision he favoured. Abu Musa al-Ashari agreed to open the proceedings, and said, "We have devised a solution after a good deal of thought and it may put an end to all contention and separatist tendencies. It is this. Both of us remove Ali as well as Muawiya from the caliphate. The Muslims are given the right to elect a caliph as they think best." Ali refused to accept the verdict, in breach of his pledge to abide by the arbitration. This put Ali in a weak position even amongst his own supporters. The most vociferous opponents of Ali in his camp were the very same people who had forced Ali to appoint their arbitrator, the Qurra who then became known as the Kharijites. Feeling that Ali could no longer look after their interests Also fearing that if there was peace, they could be arrested for the murder of Uthman they broke away from Ali's force, rallying under the slogan, "arbitration belongs to God alone." The Qurra then became known as the Kharijites ("those who leave"). The Kharijites then started killing other people. In 659 Ali's forces finally moved against the Kharijites and they finally met in the Battle of Nahrawan. Although Ali won the battle, the constant conflict had begun to affect his standing. Tom Holland writes "Ali won a victory over them as crushing as it was to prove pyrrhic: for all he had done, in effect was to fertilise the soil of Iraq with the blood of their martyrs. Three years later, and there came the inevitable blowback: a Kharijite assassin.". Ali was assassinated by Kharijites in 661. On the 19th of Ramadan, while Praying in the Great Mosque of Kufa, Ali was attacked by the Khawarij Abd-al-Rahman ibn Muljam. He was wounded by ibn Muljam's poison-coated sword while prostrating in the Fajr prayer. When Alī was assassinated, Muawiyah had the largest and the most organized and disciplined force in the Muslim Empire. Six months later in 661, in the interest of peace, Hasan ibn Ali made a peace treaty with Muawiyah. By now Hassan only ruled the area around Kufa. In the Hasan-Muawiya treaty, Hasan ibn Ali handed over power to Muawiya on the condition that he be just to the people and keep them safe and secure and after his death he does not establish a dynasty. In the year 661, Muawiyah was crowned as caliph at a ceremony in Jerusalem. Ali's caliphate had lasted for 4 years. After the treaty with Hassan, Muawiyah ruled for nearly 20 years most of which were spent expanding the state. ↑ Martin Hinds. "Muʿāwiya I". Encyclopaedia of Islam (2nd ed.). Brill. Retrieved 21 September 2014. ↑ Modern Intellectual Readings of the Kharijites By Hussam S. Timani Page 49 Some modern scholars like R.E. Brunnow trace the origins of the Qurra and the Kharitites back to Bedouin stock and desert tribesmen, who had become soldiers not out of commitment to Islam but to share the spoils. Brunnow held that the Kharijites were Bedouin Arabs (Beduinenaraber) or full blooded Arabs. 1 2 3 4 5 6 7 8 9 10 11 12 13 14 Hadhrat Ayesha Siddiqa By Allamah Syed Sulaiman Nadvi p. 44"
↑ Ground Warfare: H-Q edited by Stanley Sandler, p. 602. Books.google.co.uk. Retrieved 2013-04-30. ↑ History of Israel and the Holy Land By Michael Avi-Yonah, Shimon Peres. Books.google.co.uk. Retrieved 2013-04-30. Ali ibn Abi Talib (1984). Nahj al-Balagha (Peak of Eloquence), compiled by ash-Sharif ar-Radi. Alhoda UK. ISBN 0-940368-43-9. Holt, P. M.; Bernard Lewis (1977). Cambridge History of Islam, Vol. 1. Cambridge University Press. ISBN 0-521-29136-4. Djaït, Hichem (2008-10-30). La Grande Discorde: Religion et politique dans l'Islam des origines. Editions Gallimard. ISBN 2-07-035866-6. Arabic translation by Khalil Ahmad Khalil, Beirut, 2000, Dar al-Tali'a.